Model T Ford Forum: Old Photo - So What's Going On Here ? Old Photo - So What's Going On Here ? Model T Ford Forum: Forum 2018: Old Photo - So What's Going On Here ? Looks like after a flood. Seeing what's salvagable. Fire, water from trying to put it out. Tires, wood and steering wheel material missing. Probably after the fire at a big auto show that happened in the center of the country, I think around Chicago or ST. Lous. Aaron, Might have been this one in Los Angeles in 1929. Not swap meet, SWAMP meet. Looks like it was after a fire to me . The woods in the background don't look right for the LA fire. The overexposure makes it look like a bunch of ghosts floating amongst the burned cars. Being an open area with woods behind, may be a meeting hall or revival tent that burned to the ground. Appears to be a lot of structure that came down in the background and didn't burn flat. So must have been firefighters on the scene to put out that terrific braze. Obvious this fire that occurred impacted a lot of men and women and children seen in the debris aftermath searching for effects or love ones, likely they had personal knowledge of what transpired. The bus vehicle in foreground may have been part of transport, and other lost private vehicles. The Nordstrom girl is having an auction. The guy bottom right knows it was him. The T in the front has what looks like a melted tire. 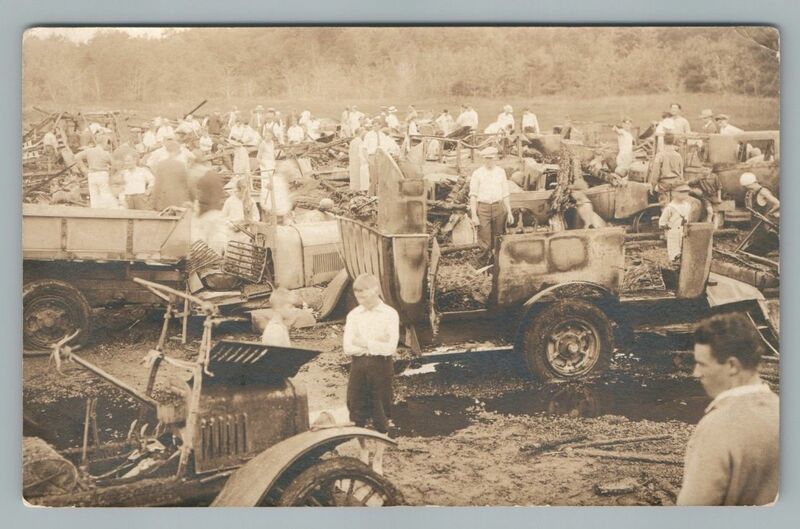 The vehicle on the right you can see heat marks on the side and in the back where wood slats behind the seat burned out. the next unit behind it looks to have charred timbers or something on it. It even burned the firewall out of the T.
There's a guy near the right rear who is pointing at the arsonist a a big guy further right who's gonna go get him. Could it be a WWII Scrap drive?